Update: Frequently Asked Questions About Valuentum Securities, Inc. - Valuentum Securities Inc.
You are here: Home » » Update: Frequently Asked Questions About Valuentum Securities, Inc.
Valuentum (val∙u∙n∙tum) [val-yoo-en-tuh-m] Securities Inc. is an independent investment research publisher, offering premium equity reports and dividend reports, as well as commentary across all sectors/companies, a Best Ideas Newsletter (spanning market caps, asset classes), a Dividend Growth Newsletter, modeling tools/products, and more. Independence and integrity remain our core, and we strive to be a champion of the investor. Valuentum is based in the Chicagoland area. How do I subscribe to Valuentum’s investment research services? 1) Click the following link: https://valuentum2.ssl.subhub.com/subscribe. 2) Select your currency, either United States Dollars or United Kingdom Pounds. 3) Click the Next button. 4) Select your membership plan. 6) Enter your contact details. 7) Click the Next button (or depending on your browser, you will be auto-forwarded to PayPal's secure site). 8) Click the PayPal button to pay through PayPal. 10) Your payment profile may be recurring, so please check that your settings in PayPal are as you desire. Need to pay by debit/credit card? Click here. How do I login? Where can I find Valuentum reports on my stocks? And where can I become more familiar with how to best use Valuentum’s website? For the most recent tutorial, please click here. What is Valuentum’s cancelation policy? When you begin your membership, we do not accept payment from you. Only when the first 14-days free period ends will you then be charged the subscription fee. Your subscription will automatically renew on the basis of your payment cycle. If you are not happy with our service for any reason, cancel within 14 days of your start date (during the free period) by emailing info@valuentum.com saying that you would like to cancel. You will not be charged anything. After the first 14 days, you may cancel at any time, and we will recalculate the cost of the subscription for the period the subscription was used (at current applicable monthly rates) and will refund any difference less transaction fees. No refunds are provided for monthly subscriptions or for the Nelson Exclusive publication. The Nelson Exclusive publication also does not have a free period. How frequently are the (stock and dividend) reports updated and what triggers an update? The 16-page stock and dividend reports are generally updated every 3-4 months or when material results alter our estimate of a company's fair value. This update cycle is typical for investment research firms. Fair value estimates do not change much over short-term periods of time, especially if our estimate of a company's intrinsic value is spot on. Although the date, data, or text on our reports may not change daily for each company, one can assume that if the reports are live on the site, the conclusions of the company in the report are still representative of our view on the stock or its dividend. Importantly, by using our 'Symbol' search box in our header, one can gain access to some of the most advanced charting features to augment our Valuentum Buying Index's technical/momentum assessment. The charts are equipped with real-time data. The 'Symbol' search box in our website header is also the best way to find our recent articles and analysis (as well as the 16-page equity and dividend reports) on companies of interest to you. How do some readers use Valuentum's services? What are the advantages of using Valuentum’s investment services? What is the Valuentum Buying Index (VBI)? Download (pdf): "Value and Momentum Within Stocks, Too"
Why does a stock have a good Valuentum Buying Index rating but a poor dividend growth profile? The intrinsic value of a stock (company) is independent of the size or quality of its dividend payment or its dividend growth profile. Note: dividend payments are just a portion of a firm’s total free cash flow (earnings), and intrinsic value is driven by all of the future free cash flows (earnings) that belong to shareholders. The discounted cash-flow valuation process for firms rests on assessing the discounted future free cash flows of an entity in arriving at a fair value estimate for that entity. We then use a margin of safety to better pinpoint an entry/exit point that captures the risks inherent to the company's business model. After doing this and conducting a relative value assessment, we then evaluate the technical and momentum indicators of the firm to further reinforce our entry/exit points. This process culminates in our Valuentum Buying Index (VBI), which uses a rigorous DCF evaluation, relative value assessment, and technical and momentum indicators to derive a score between 1 and 10 (10=top pick). When evaluating a company’s dividend, we sum the future expected free flows of the firm and divide that sum by future expected dividend payments over a five-year period (and consider the company's net balance sheet impact). If this relationship is below parity (1), we don't think the firm's dividend growth potential is strong. In other words, this analysis reveals the company doesn’t have a significant amount of capacity to raise the dividend. However, that doesn't mean the shares of the exact same company aren't undervalued and that investors aren't interested in other parameters that drive the company’s VBI rating -- which we think captures the major factors that drive a firm's future capital appreciation potential. All things considered, it is perfectly consistent for a company to score high on our VBI scale and not have strong dividend growth prospects. Alternatively, it is perfectly consistent for a firm to score low on our VBI scale and have strong dividend growth prospects. What web browser should I use to operate Valuentum.com? Our website works best on Internet Explorer 9, Chrome, Firefox or Safari. You can click on the links to download them for free. Since the charts we use on our website have html5, Internet Explorer 8 and previous versions of web browsers do not support them. Where can I get an education on the methodology and technical definitions of the terms used in your service? Do you have support that shows that the Valuentum Buying Index methodology was effective via backtesting? Do you have a white paper? Yes. Download (pdf): "Value and Momentum Within Stocks, Too"
Pasted below is the link to our white paper discussing the benefits of 'Valuentum' investing. Where can I find the current and previous editions of Valuentum’s Best Ideas Newsletter and Dividend Growth Newsletter? Also, where can I find the Nelson Exclusive archives? The High Yield Dividend Newsletter is only delivered by email at this time. Why did the Valuentum Buying Index (VBI) rating change on my stock? A stock’s Valuentum Buying Index rating is based on our view of the attractiveness of a company’s discounted cash-flow valuation, its relative valuation versus peers, and an overall technical/momentum assessment. If our views on any of these three investment pillars change, a company’s Valuentum Buying Index rating will change to reflect this new view. Download slide deck here (pdf). We use our methodologies and our experience and judgment to build the newsletter portfolios. Achieving the goals of the newsletter portfolios is our primary objective with our regular premium service. As it relates to the Best Ideas Newsletter portfolio, for example, if a stock registers a 9 or 10 on the Valuentum Buying Index in our coverage universe, we would consider adding it to the newsletter portfolio. When the stock then/eventually registers a 1 or 2 on the Valuentum Buying Index in time, we might then consider removing it from the newsletter portfolio. The changes in the "big middle" of the Valuentum Buying Index offer more tactical considerations, but we generally only consider the highest and lowest VBI ratings to be material. During times of market froth, however, as in arguably today's environment, in the Best Ideas Newsletter portfolio, we may relax some of the VBI criteria and consider undervalued stocks with neutral technical/momentum indicators, or fairly valued stocks with good relative valuation metrics and strong technical/momentum indicators. We may only consider removing ideas from the simulated newsletter portfolios when both their valuation and technical/momentum indicators point in the same direction (good/good or poor/poor), or if we're making more strategic/tactical moves. The criteria for the Dividend Growth Newsletter is somewhat different. We're looking for strong dividend growth stocks in this simulated Dividend Growth Newsletter portfolio (something that is not a part of the criteria in the oBest Ideas Newsletter portfolio), meaning that in addition to considering the VBI and fair value estimate range, the Dividend Cushion is also very important. We still look to add highly-rated stocks on the VBI and those that are undervalued to this onewsletter portfolio, but we may be more open to ideas that have strong dividend growth prospects, on the basis of the forward-looking Dividend Cushion ratio. After adding ideas to this onewsletter portfolio, we may continue to include them in the portfolio even if they have modest VBI ratings that are trading within our fair value estimate range, as long as they have strong dividend growth prospects. We'd only consider removing a stock from the oDividend Growth Newsletter portfolio when we lose confidence in its intrinsic value support and its dividend growth prospects. The way to think about our process is rather simple. In the Best Ideas Newsletter portfolio, if a company registers a high rating in our coverage universe, we consider adding it (but we won't consider adding all companies because of portfolio constraints). If we do decide to add the idea, then we watch its fair value estimate and technical/momentum indicators as it navigates the "big middle" of VBI ratings, and only consider removing the idea from the Best Ideas Newsletter portfolio if it registers a 1 or 2 on the Valuentum Buying Index. In the Dividend Growth Newsletter portfolio, we pay attention to the price-versus-fair value estimate range and the company's Dividend Cushion ratio, as we're looking for resilient equities with intrinsic-value support that have strong dividend growth prospects. Only when intrinsic-value support and dividend growth strength wane will we consider removing an idea from the Dividend Growth Newsletter portfolio. Stocks included in the Best Ideas Newsletter portfolio and Dividend Growth Newsletter portfolio should be considered our best ideas at any given time, regardless of their Valuentum Buying Index ratings. How do I find stocks that meet my investment criteria? Valuentum’s broad focus across investment methodologies (from value through momentum) allows us to provide subscribers with a variety of tools, metrics and screens that are unique. Subscribers can access our available stock screens on the left column of our website under the ‘Stock Screens’ category, or they can purchase our DataScreener, which contains sortable data and information on firms in our coverage universe. Where can I find the highest-quality stocks that Valuentum covers? Please learn about the Economic Castle rating here. Where can I find stocks with the best dividend growth profiles? Please learn about the Dividend Cushion ratio here. First of all, I want to say thank you for all the work that you and the Valuentum team does. I really appreciate the amount of time and effort that must go into all of the information that you provide. I have had a question for a while which I was always curious about, and finally decided to send it in to get your take. How should an individual use the Valuentum Buying Index rating when they just start using this indicator as input on new positions? In other words, how does someone build their own portfolio? The VBI rating on the majority of the best ideas would not indicate a time to buy. For example, is "AIG" currently a better idea than "AAPL" for a new investor based on their VBI indicators? There is clearly more going into the transactions then just VBI rating. The website indicates that the Best Ideas Newsletter portfolio contains the best ideas at any point in time, but the VBI rating on many of them would not indicate that someone should start a new position in them. I understand that portfolio management is a different topic then valuation, but I was interested to know how the Valuentum team would go about building a new portfolio if they were to start today. As you mentioned, we primarily use the Valuentum Buying Index as a screening mechanism to surface new ideas for consideration. The rating is not absolute within the investment-decision making process, meaning that there are other factors beyond the rating that we consider before a company is added to the newsletter portfolios, the most important of which is approval from the Valuentum team (a precursor to adding the company to the newsletter portfolios). Our research indicates that the VBI rating is highly effective across large sample sets, but we take greater care when running the concentrated newsletter portfolios which target 15-20 holdings, not 500+ as in the published case study. To your question in particular: "How should an individual use the VBI rating when they just start using this indicator as input on new positions?" We're not aware of your personal goals or risk tolerances, so we don't have a basis for suggesting how you should build a portfolio, or phase into holdings over time. We can never give any personal financial advice in that regard. That said, we use the VBI as a screening mechanism to surface ideas we want to add to the existing simulated newsletter portfolios, to augment the existing positions in the newsletter portfolios in order to achieve the goals of both newsletter portfolios. We tend to add most 9s and 10s to the newsletter portfolios, but not all of them, and hold the ones that we add until they surpass fair value and begin to "roll over" from a technical standpoint, usually registering a 1 or 2 at that time. We take a disciplined approach to new idea generation, so 9s and 10s don't come up too frequently. Apple is a holding in both newsletter portfolios, while AIG is not included, so we prefer the former despite its relatively lower VBI rating. The latter, however, is still highlighted as an idea, but it's just not for the Valuentum newsletter portfolios. Here's why: http://www.valuentum.com/articles/20120805. There's a lot that goes into adding a company to the newsletter portfolios. Portfolio additions undergo a rigorous analyst-driven qualitative process, while the VBI rating is largely a quantitative output, though it, too, is driven by analyst expectations. The following goes into why we consider the holdings in the newsletter portfolios the best ideas at any given time, and why at times non-portfolio holdings can have higher weightings than portfolio holdings: http://www.valuentum.com/articles/20151026_1. Please let us know if we can elaborate further. If I am looking at a 1 or 2 month old Valuentum Buying Index, and the price and technicals have changed substantially, how useful is that Valuentum Buying Index rating? It just seems that the Valuentum Buying Index, for which price/fair value and technicals are factors, would require more frequent updates to be meaningful. Stocks that were overvalued at update time, that have corrected 10-15% (or more), surely have a different Valuentum Buying Index. Great question. We could update the VBIs more frequently, but we think doing so only increases the likelihood of false technical/momentum signals (false breakouts, false breakdowns), which could "whipsaw" members. We think the update cycle comes down to practicality, too. We emphasize analyst oversight with respect to our reports and rating system, as opposed to a fast-moving quantitative output, which would result in rapid changes in the VBI, and arguably make the VBI less meaningful (in the case it changes so much over such a short period of time). Importantly, however, the VBI is just one aspect of our research, and we use it as a tool much like any other (the fair value estimate, the fair value range, Economic Castle, Dividend Cushion, the P/E ratio). The VBI question is not the easiest one to answer but we're working on triangulating on what makes the most sense for readers. In any case, we hope you see a lot of value in what we have to offer! What is the most important measure of return on invested capital (ROIC), in Valuentum’s opinion? We think return on new invested capital (RONIC) is the most important measure of whether a company is generating economic value for shareholders. Though we look at ROIC with goodwill and ROIC without goodwill (and each one is informative depending on a company’s acquisition program), we view the capacity of a company to generate economic value in the future (RONIC) as the best indication of its ability to translate such business performance into equity price outperformance, all else equal. Read more about this in Value Trap. How often does Valuentum make changes to its actively-managed portfolios held within the Best Ideas Newsletter and Dividend Growth Newsletter? What is the typical holding period for picks made? The Best Ideas Newsletter portfolio and Dividend Growth Newsletter portfolio may be fully invested at times, and it may not make sense for us to add or remove a company each month. That's just not how we look at things. However, we actively provide ongoing coverage of stocks and ETFs on our website and other ideas to consider in each monthly edition. What does Valuentum mean when it says it helps investors avoid value traps, falling knives, and the opportunity cost of buying a great stock at the most inopportune time? Have you ever held an undervalued stock for years, and it hasn’t yet converged to what you think it is worth? This is opportunity cost, and we think it is a real expense for investors. Because our process factors in a technical and momentum assessment after we evaluate its attractiveness via our valuation process, we think we're better able to pinpoint the best entry and exit points on stocks. We also think we’re less likely to be involved in value traps because we demand material revenue and earnings growth for stocks to earn a 10 on the Valuentum Buying Index, and we think we’re less likely to be exposed to falling knives since our process requires firms to not only be undervalued but also be exhibiting bullish technicals before we would consider adding them to the Best Ideas Newsletter portfolio. Research firms that just focus on valuation may encourage readers to buy a stock all the way down (a falling knife). As such, we think our process helps investors avoid the opportunity cost of buying a great stock at the most inopportune time. Where can I directly find the 16-page stock reports on Valuentum's website? The 'Symbol' search box in our website header is the best way to find our recent articles and analysis (as well as the 16-page equity and dividend reports) on companies of interest to you. In your 16-page equity reports, why doesn't the 'percentage undervalued / overvalued' match up to the actual discount/premium to Valuentum's fair value estimate of the company? We view the intrinsic value of a company as a range, not a single point estimate. So instead of us saying that a company is worth exactly $55 per share, for example, instead we'd say it is worth between $50 (low end) and $60 per share (high end). We say this as a result of to the inherent 'impossibility' of predicting with absolute precision a firm's future free cash flow stream, which determines our estimate of the company's intrinsic value. As a result, the 'percentage undervalued/overvalued' is calculated by comparing the firm's current price with the low end and high end of its fair value range (and not the single fair value point estimate), respectively. If a stock's price falls below the low end of our fair value range, we'd view it as cheap. If the price is above our fair value range, we think the company's shares are expensive. Does a 'Very Poor' score on Valuentum's assessment of a company's dividend safety mean the firm will cut its dividend in future periods? Not necessarily. In many cases, a 'Very Poor' dividend safety score will predict a cut, as this is what the Valuentum Dividend Cushion ratio has been designed to do. However, in other cases, the Valuentum Dividend Cushion ratio may highlight significant risk related to future dividend payments (but not necessarily suggest that a cut is on the horizon). For one, the assessment of a company's dividend safety is based on the excess cash-flow capacity the firm has for future dividend raises after considering its balance sheet structure. By extension, there will be a positive correlation between the safety of a firm's dividend and its future potential for growth. In other words, the larger the capacity the firm has to raise its dividend based on our Valuentum Dividend Cushion ratio, the more secure existing dividend payments are. However, just because a firm has a 'Very Poor' dividend safety score doesn't necessarily mean it will cut its dividend anytime soon. What a low safety score does mean, however, is that the board has effectively maxed out the company's annual payout and has little room for operating error. In fact, a lot of steady-eddy utilities firms receive a 'Very Poor' safety rating. However, based on the stability of their business models (and sometimes fixed rate of returns), we're not expecting them to cut their respective dividends anytime soon. However, should an exogenous event happen, the board hasn't left much excess cash-flow capacity to absorb the impact and the dividend may be exposed to significant risk (think of the most recent examples of Exelon and First Energy). Out of the dozens or so ideas we have selected to include in the simulated Best Ideas Newsletter portfolio since inception (excluding options), many have outperformed the market. Stocks such as EDAC Tech and Apple have been significant sources of return for the Best Ideas Newsletter portfolio, more-than-tripling and nearly doubling in price, respectively. Download an extensive analysis of the simulated Best Ideas Newsletter portfolio here. The performance of Nelson Exclusive ideas has also been great, with "success" rates from highlight price to 'close' price of ~75% through June 2017. Read more about the Exclusive here. I have downloaded your last Best Ideas Newsletter and didn’t quite understand where to find your best ideas? There are several articles about firms not in your portfolio. Are these your ideas for buying or should I refer to the Best Ideas portfolio itself? In the monthly Best Ideas Newsletter, we provide a wealth of information as it relates to our opinion of stocks in the news as well as a simulated portfolio of best ideas and a watch list of firms that score high on our Valuentum Buying Index. We use the Valuentum Buying Index as the primary criteria for adding or removing firms to or from the Best Ideas portfolio, respectively. Because the simulated portfolios have stringent oversight and a portfolio-management overlay, we may not add all companies that have high ratings on the Valuentum Buying Index to the portfolios due to diversification, cost, or broader-market considerations. The goal of the Best Ideas Newsletter is to highlight ideas with strong capital appreciation potential and to update readers about new developments in the market. A simulated portfolio of capital appreciation ideas is presented on page 8 of each edition. Within the simulated newsletter portfolio, we strive to limit turnover and transaction costs, pursue diversification benefits, and engage in option strategies to capture our view on broader market trends or on individual ideas. In each edition of the Best Ideas Newsletter, we also include a watch list of firms to supplement the portfolio, as we understand that subscribers and clients may have different goals and varying investment mandates. Our best ideas are the companies included in the newsletter portfolios (the Best Ideas Newsletter portfolio and Dividend Growth Newsletter portfolio), the Nelson Exclusive publication, as well as the companies that score high on our Valuentum Buying Index. However, you should always consult your financial advisor to determine whether any investment in any security is suitable for you. At no time should any content on our website or in any transaction-alert email be viewed as a solicitation to buy or sell any security. Why don't your VBI ratings change on a daily basis? Investors can sell a stock for reasons unrelated to a company's fundamentals, and at times, make poor decisions on the basis of misinformation, driving a firm's shares lower. In our view, it simply takes time to get an accurate read on any fundamental or technical changes of a company's stock. We want to deliver ideas with conviction and confidence and not alter our views on a firm on a daily or even weekly basis. I am wondering about the difference in dividend increases for the current fiscal year between what is showing on your reports and what we believe are the actual increase numbers for some companies. Here are some examples: CL -- Valuentum shows 8.3%; actual increase on 3/6/14 was 5.8%. MDT -- Valuentum shows 7.7%; actual increase on 6/16/14 was 8.9%. CNI -- Valuentum shows 11.0%; actual increase on 1/30/2014 was 16.3% Any thoughts? The reporting structure of the dividend payments in the dividend reports correspond to when the payments have been paid in previous historical years. So, for example, in CL's case, the company paid the following as dividends in 2013: $0.31, $0.34, $0.34, $0.34 = $1.33 (as shown in the report). The current year 'forecast' (2014) represents the annualized rate based on the current payout ($1.44 per share). The growth rate is then derived as such ($1.44/$1.33-1). Please find an extensive read on how we derive our forecasts both in the discounted cash-flow models and with respect to dividend growth here. Why do you use a risk free rate assumption of 4.25% when the current spot rate of the 10-year Treasury is about 2-3%? 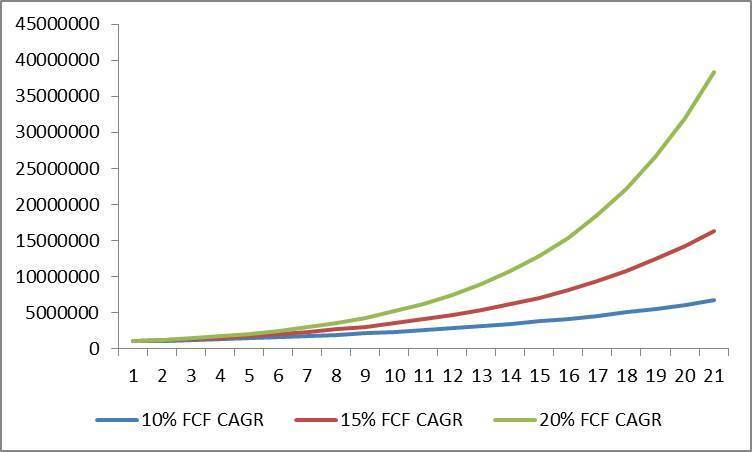 In our discounted cash-flow models that we use to value every non-financial operating company in our coverage universe, we match the duration of future free cash flows (from year 1 to perpetuity) with expectations of the average discount rate over this forecast horizon (from year 1 to perpetuity). We think the best way to achieve expectations of the long-term future average rate of the 10-year Treasury (risk free rate) is to use the weighted average of the historical 10-year Treasury and the current spot rate. The goal of using a weighted average risk free rate in our DCF process is to achieve balance with respect to the duration of future cash flows. For example, discounting a cash flow in Year 20 at the current spot rate doesn’t make much sense to us. Other methods consider the yield curve in discounting future free cash flows, or use a long-term average of the risk free rate without considering near-term changes in the 10-year Treasury rate. We think the use of the spot rate on the 10-year Treasury as the risk free rate in any valuation model would not only cause significant fair-value volatility but also result in a systematic overvaluation of companies relative to their true long-term intrinsic worth. Why do you use such a wide fair value range for certain companies? One of the most important concepts of the Valuentum methodology (and valuation in general) is the understanding that the value of a company is a range of probable valuation outcomes, not a single point estimate. Even well-seasoned stock analysts are guilty of saying that a company's shares are worth exactly $25 or a firm's stock is worth exactly $100. The reality is that, in the first case, the company's shares are probably worth somewhere between $20 and $30, and in the latter case, the stock is worth somewhere between $75 and $125. Why? Because all of the value of a company is generated in the future (future earnings and free cash flow), and the future is inherently unpredictable (unknowable). If the future could be predicted with absolute certainly (knowable), then a stock analyst could say a company's shares are worth precisely this, or that a firm's stock is worth precisely that. Not because he or she would know where the stock would be trading at, but because he or she would know precisely what future free cash flows would be (and all other modeling facts-not assumptions in this case) and arrive at the exact and non-debatable value of the firm. But the truth of the matter is that nobody knows the future, and analysts can only estimate what a company's future free cash flow stream will look like. Certain unexpected factors will hurt that free cash flow stream relative to forecasts, while other unexpected factors will boost performance. That's how a downside fair value estimate and an upside fair value estimate is generated, or in the words of Warren Buffett and Benjamin Graham how a "margin of safety" is generated. Only the most likely scenario represents the point fair value estimate. Any stock analyst that says a company is worth a precise figure--whether it's $1 or $100--falls short of understanding one of the most important factors behind valuation. But why the large range in many cases? Well, there are many firms in our coverage universe that have a very large range of outcomes in their future free cash flow growth. And because discounting free cash flows is an integral part of calculating the fair value estimate of a company, the range of fair values will also be large. To illustrate this point, let's take a look at the difference between the levels of free cash flows in Year 20 under three different future growth rates: 10%, 15%, and 20%. Though the growth rate between each scenario is but 5 percentage points, the magnitude of the free cash flow difference is astounding many years into the future, and our discounted cash-flow process considers the long-term intrinsic value of firms. Under these future free-cash-flow scenarios, if we assume an 8% discount rate and 100,000 shares outstanding (and no debt), the difference in the fair value estimate between the upside case (green line) and downside case (blue line) would be an incredible $68 per share ($82 per share less $14 per share). That's a huge fair value range (80%+), and all because of just a 10 percentage point difference in a future free cash flow growth assumption. For firms that are growing cash flows at 200% or 300% per annum, a large range of fair value outcomes is not only inevitable but also very reasonable. In other words, the Valuentum framework provides an avenue to quantify the upside and downside risks investors are taking in high uncertainty and fast-growing enterprises. 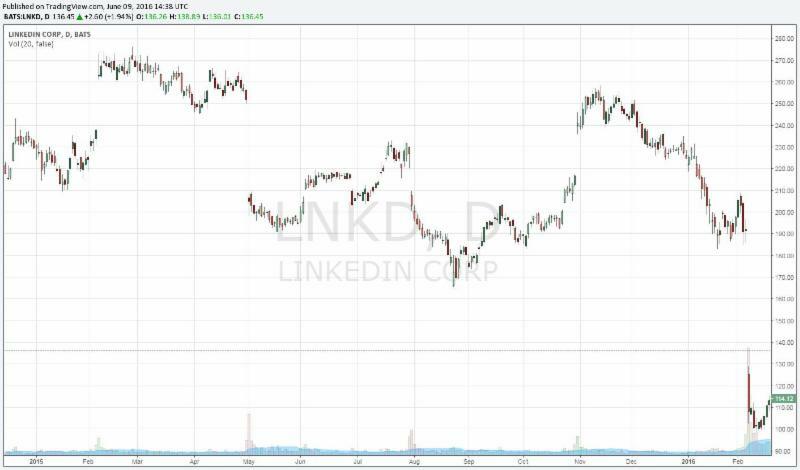 To really hit this point home, shown above is a slide of LinkedIn's (LNKD) revenue from the first quarter of 2010 through the first quarter of 2013. 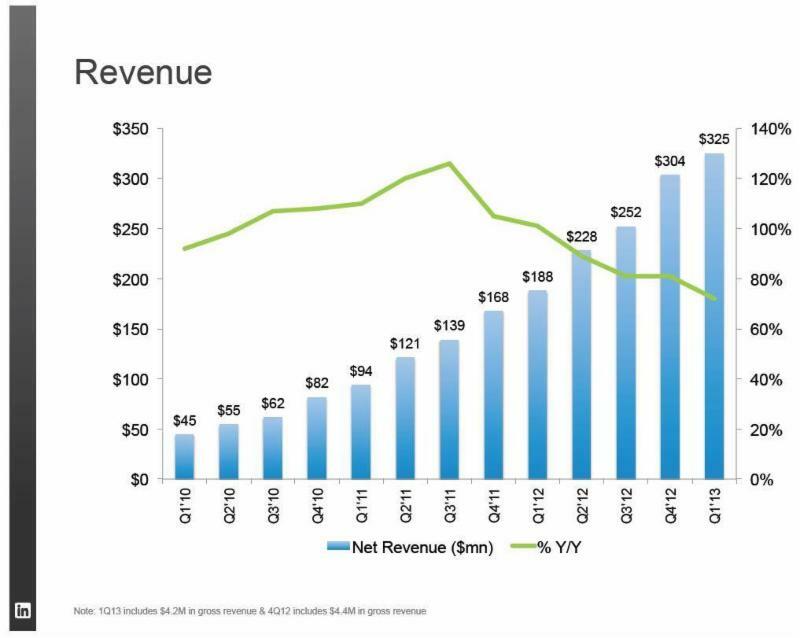 The green line (mapped to the right axis) shows LinkedIn's revenue growth rate. Let's assume revenue expansion translates into similar free cash flow growth expectations (not exactly a precise assumption, given the leverage in LinkedIn's business model), but bear with us for simplistic illustrative purposes. Will LinkedIn's revenue/cash flows expand at a 20% rate, a 40% rate, or a 60% rate (or an even greater pace) through year 20? It's a very, very difficult question to answer. Remember how significant that 10 percentage point spread was in the hypothetical example above? Well, it's even more significant for LinkedIn. We know LinkedIn's free cash flows will expand, and expand fast, but just how fast is certainly debatable. To a very large extent, that's why LinkedIn's range of probable outcomes (fair value range) is so large. Understanding the cone of fair value outcomes of a company is helpful because the size of the range tends to be positively correlated to the equity's volatility. If you recall, look at what happened to LinkedIn's stock recently when investors ratcheted down their long-term growth assumptions (and by extension, the company's intrinsic value). Shares collapsed in a huge way. But it was largely because of that same weakness in equity pricing that drove Microsoft (MSFT) to take the leap to buy LinkedIn's equity outright just a few months later. 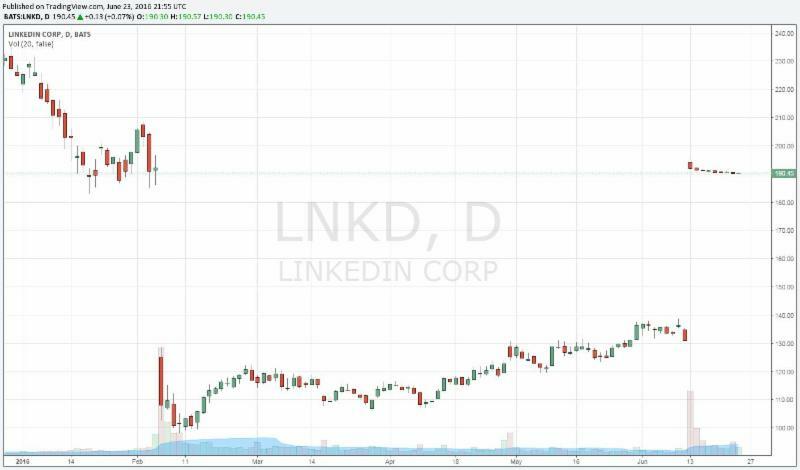 Over just a very short period of time, LinkedIn's shares effectively collapsed and then surged as the chart below shows (its intrinsic value range didn't change much, however). Having a fair value range that adequately captures both the upside and downside cases for a company's shares remains an integral part of stock investing. Not only does it help hone in on the potential risk-reward profile of an equity at any given time, it also helps reveal the attractiveness of various "entry" or "exit" points using a robust free-cash-flow based and fundamentally-sound intrinsic value estimate as the anchor. We're scouring our coverage universe for firms that are trading outside of their respective fair value ranges. A firm trading below the low end of its fair value range, for example, is undervalued, while a firm trading above its fair value range is overvalued. The fair value estimate range for each company captures the inherent uncertainty of the trajectory of that firm's unique future free cash flow stream. For the 1,000+ companies we include in our coverage universe, we provide a discounted cash flow derived fair value estimate and a corresponding fair value range -- and a robust discounted cash-flow process is only one aspect of our service. In your probability distribution of fair values, how can a company actually have a non-zero probability of a negative fair value? The way to interpret the area to the left of the $0 line (y-axis) is that it represents the probability of bankruptcy of the firm based on the uncertainty of future expected free cash flows. Though there are specific values assigned to the area to the left of the $0 line (y-axis), they are arbitrary as any equity value below $0 is actually an event of default if liquidity dries up (eating into bondholders). 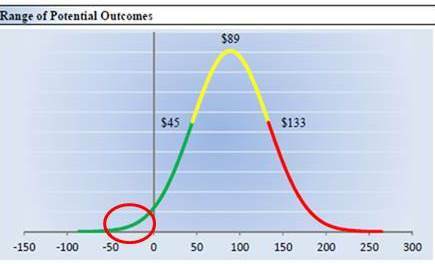 So the small area underneath the green curve to left of the $0 line (y-axis) and down to the x-axis (which is a mapping of fair values) represents the probability of bankruptcy (default) given the firm's fundamental future cash flow profile and balance sheet leverage. We disclose the probability of bankruptcy/default of each company in our reports. Valuentum plans to eventually use these probability-of-default estimates to calculate a corporate credit rating for each entity. At any point in time, I haven't found many stocks with VBI ratings of 9 or 10. Some stocks like CSCO, KORS or BWLD seem to have almost characteristically high VBI's. For sure, I should have immediately bought some names when you added them to the Best Ideas Newsletter when there VBI's were 9 or 10. However, after missing them upon their initial recommendation, I always had doubts as to whether they are still warranted as being highlighted as new investments after they have risen in price and their VBI's have fallen below 9 or 10. One suggestion: each month I wish you would highlight any stocks in the Best Ideas Newsletter portfolio you would buy NOW. Stocks added to the list as 9's or 10's now at 5, 6, or 7 may or may not be candidates for new investment just as all stocks with 9's or 10's are not added to the list for qualitative reasons. First, please note that our ideas are just ideas, not recommendations. Please always consult your personal financial advisor that is aware of your individual goals and risk tolerances to see if any idea is right for you. That said, your question comes up a lot. We've pondered having a special categorization of the VBI for best ideas in both newsletters but we haven't implemented it. For example, we've thought about changing their VBIs to 10+, but this would compromise our rating system. At any time, whether a holding was added near inception or a holding is added two months from now, they are treated equally as new, interesting "best ideas." As we continue to emphasize in all of our writings, our best ideas for consideration at any time are included in the newsletter portfolios. A portfolio manager must make a conscious decision to hold a stock every single day, and this conscious decision is reflected in it being one of his or her best ideas on a go-forward basis at that time. Only when it is removed from the portfolio is it no longer a best idea consideration. Hope this helps explain how we think about our best ideas in building a portfolio! Question regarding your ratings for dividend growth. I was checking out your recent list of stocks listed by Dividend Cushion ratio and reading dividend report for the top one (CIR); you give it a dividend growth rating of "GOOD". Though the company’s Dividend Cushion ratio is good, how do you justify this rating since management has not seen fit to raise the dividend in the past 15 years, and your own projection table at the right of the page projects 0% dividend growth in future years? By your own records and this history, wouldn't this stock warrant a Dividend Growth rating of 'VERY POOR"? Interested in your response. Thanks. This is a great question because it allows us to explain the layers embedded within our analysis, and what exactly the Dividend Cushion ratio measures, and what it doesn’t. First, your question is probably more appropriately phrased as: why is CIR's Dividend Growth Potential GOOD (emphasis on “potential”), as it is the title that corresponds to the GOOD rating and what the rating applies to. In many ways, this answers your question: the Dividend Cushion ratio is strong, and therefore the company has tremendous potential to raise the dividend if it so chooses. In particular, the Dividend Cushion ratio measures the capacity of the company to keep raising the dividend in the future. It does not measure the board’s willingness to keep raising the dividend, which is another important consideration, something best expressed with an assessment of the company’s historical dividend track record. Both capacity and willingness must be present to uncover the best dividend growth ideas for the coming years, in our view. That’s why CIR doesn’t make the cut for the Dividend Growth Newsletter portfolio. CIR has a relatively small dividend yield as well. In this light, it should be no surprise that the company has the capacity to cover such a minor payout given that it is a rather small financial obligation. Perhaps most importantly, management and the board can do whatever they want with the dividend. We see cases all the time where a company puts up terrible performance and raises the dividend on hopes that investors will be satisfied with an increased payout that theoretically they already own. The Dividend Cushion ratio is a pure reflection of the financials used to assess the dividend growth potential of the company in the context of a firm’s balance sheet and future financial forecasts. It is not a measure of willingness. Sometimes the board stretches too much with the payout; sometimes the board falls short. The Dividend Cushion ratio is the yardstick that measures the dividend growth potential of each entity. 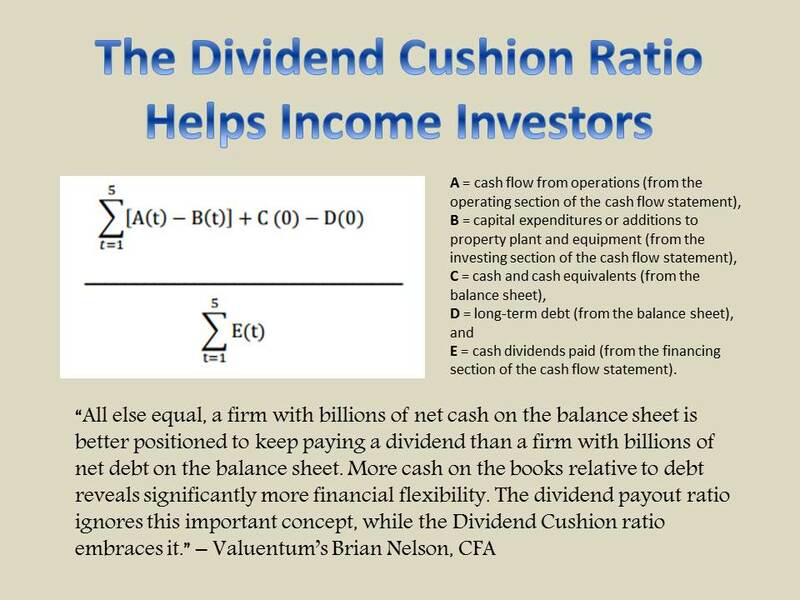 It perhaps goes without saying, however, that the Dividend Cushion ratio is not all that we provide with respect to dividend analysis. We publish our assessment of the company’s dividend track record, too, and we're doing tons more beyond the dividend analysis itself. Hope this helps clarify. I'm a subscriber. I'm looking at your dividend report for Enterprise Product Partners (EPD). It says your Valuentum Dividend Cushion ratio for EPD is 2, but several lines below it says the unadjusted Dividend Cushion ratio is 0.25. Please explain the difference between the two ratios, and what is considered a good score for the unadjusted Dividend Cushion ratio, what is an excellent score, what is neutral and what is poor? Also, how much relative importance should I give to each score? Also, further down in the section on unadjusted Dividend Cushion, the chart of EPD has a large negative number in the blue bar, and your text says: "Generally speaking, the greater the 'blue bar' to the right is in the positive, the more durable a company's dividend, and the greater the 'blue bar' to the right is in the negative, the less durable a company's dividend." So that means that EPD's dividend isn't durable, yet your report earlier says that EPD's Dividend Safety rating is GOOD. Can you elaborate? Thank you for your question. It is a great one because it hits at the heart of the capital-market-dependency risk inherent to MLPs. First, the raw, unadjusted Dividend Cushion ratio adds a firm's net cash position to the sum of its future free cash flows (cash flow from operations less all capital spending) over the next five years and takes that sum and divides it by the sum of the company's expected cash dividends paid and growth in them over the next five years. The Dividend Cushion ratio is essentially a coverage ratio -- the higher the ratio above 1, the better able the company will be able to cover dividend payments in the future, in our view. For most of our coverage and for most corporates, the qualitative ratings for safety and growth are a function of the raw, unadjusted Dividend Cushion ratio, as shown below. For MLPs, REITs, and some utilities, however, we make modifications to the raw, unadjusted Dividend Cushion ratio in deriving the adjusted Dividend Cushion ratio. For example, with MLPs, we add back future equity issuance to the numerator and mitigate the company's debt load to a degree on account of assuming ongoing refinancing capacity for such entities. These adjustments result in a sharp upward revision to the raw, unadjusted Dividend Cushion ratio. For MLPs, REITs, and some utilities, we base the qualitative rating on this enhanced adjusted Dividend Cushion ratio, but we also disclose the raw, unadjusted Dividend Cushion ratio in each case. In short, we believe both the raw, unadjusted Dividend Cushion ratio and the adjusted Dividend Cushion ratio offer insights. The former reveals the capital-market-dependency risks inherent to MLPs, for example, while the latter acknowledges that under benign market conditions, continued funding of the distribution/dividend would ensue. We place greater emphasis on the raw, unadjusted Dividend Cushion ratio because it is more of a pure risk measure than the adjusted one, which considers a variety of incremental funding sources, which cannot be guaranteed during difficult credit conditions. We don't include any individual MLPs in the Dividend Growth Newsletter portfolio (as of early 2017, we did include an ETF holding energy MLPs, however). Dividend Safety. We measure the safety of a firm's dividend by adding its net cash to our forecast of its future cash flows and divide that sum by our forecast of its future dividend payments. This process results in a ratio called the Dividend Cushion™. Scale: Above 2.75 = EXCELLENT; Between 1.25 and 2.75 = GOOD; Between 0.5 and 1.25 = POOR; Below 0.5 = VERY POOR. I don't understand why Oracle (ORCL)--with a very attractive Economic Castle and a Dividend Cushion of 5.3 doesn't deserve a prominent place in the Valuentum portfolios. Why has the Economic Castle changed from "highest rated" to "very attractive"? Despite your article "Oracle's Cloud Performance Leaves a Hazy Overall Outlook" dated June 22, the fair value was not updapted in the September report. A lot of fuss about nothing? This is a great question because it hits at the heart of the difficult portfolio allocation decisions in managing the simulated newsletter portfolios. We imagine that many members have similar questions about companies that they like, too: why aren't they part of the newsletter portfolios? In short, you are correct. Oracle is a fantastic business, has a strong Economic Castle rating, and fantastic dividend coverage. Shares are also undervalued (at the time of this writing), though the company's Valuentum Buying Index rating, which considers a 'market conviction' assessment through an evaluation of pricing strength, is not that great; part of the reason why we're not pushing to add it to the newsletter portfolios right now. That said, Oracle is a top consideration. The primary reason why Oracle, and many other top-rated companies, are not included in the newsletter portfolios may have nothing to do with them at all, and everything to do with the opportunity cost of investing. In the case of Oracle, for one, we're already quite tech-heavy in the newsletter portfolios, and it's difficult to argue with the fantastic performance of Apple and Microsoft the past few years. We like Oracle. We've just liked a few tech names better, but Oracle has done well, too. In many ways, it comes down to the idea that we can't include every company we like in the newsletter portfolios, mostly due to sector weighting considerations. In all cases, however, we do our best to highlight those that may not be in there via their attractive price/fair values, Economic Castle ratings, and Dividend Cushion ratios, an oftentimes, their better-than-average Valuentum Buying Index ratings. As for fair value changes and updates, they can occur for a number of reasons, but generally speaking, incremental news that impacts the near term may not have as great of an impact as news that may impact our long-term thesis and mid-cycle expectations. We comment frequently on companies in our coverage, and our fair value estimates are updated to reflect the ongoing evolution of our thoughts. 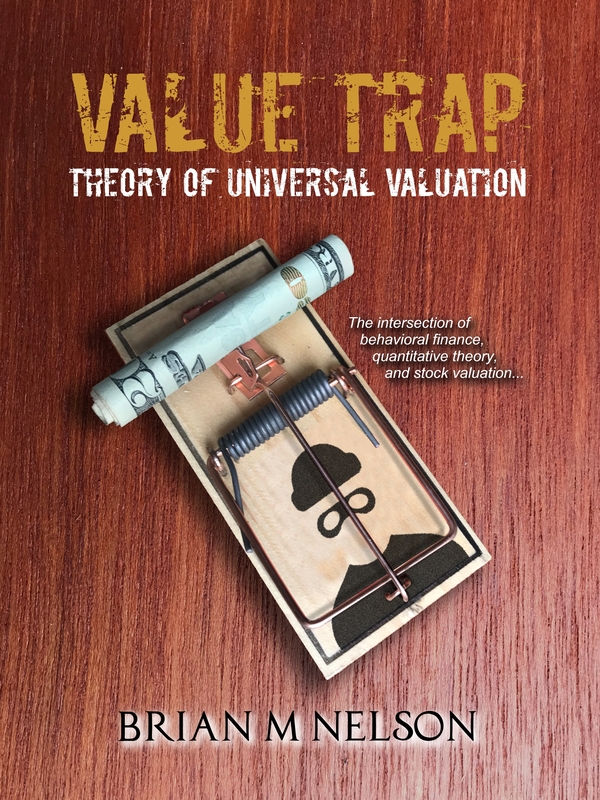 What is Value Trap: Theory of Universal Valuation? Wall Street doesn’t know it has a problem. Index and quantitative investors have been free-riding on the backs of active managers for years, but growth in price-agnostic trading may finally have reached the tipping point. Brian Nelson, former Director of Methodology at Morningstar and President of Investment Research at Valuentum, explains how enterprise valuation forms the Theory of Universal Valuation and why a focus on it may not only help you avoid value traps, but also save you from the next financial crisis. This is a 350 page book, including Preface, Notes, Bibliography and Index. Download the electronic sell sheet here (pdf). The text is a response to many worrisome trends and processes in the investment management business today. The book strives to answer the question: what is the appropriate empirical evidence in evidence-based finance? Surely, not just any empirical evidence will do. The book is not meant to be controversial, but a discussion of the great contradiction of “explaining” stock return behavior between factor-based investing (which is based mostly on ambiguous, realized data within in-sample sets) and the efficient markets hypothesis (which is based on expectations of future data, realized or not) may make it so. The text is heavy in behavioral thinking and puts forth enterprise valuation as a behavioral framework in which to view stock prices and their movements. This book also shows how enterprise valuation is much more than a simple stock valuation tool, but rather that enterprise valuation is truly universal valuation, resting at the intersection of behavioral economics, quantitative theory, equity valuation, and therefore finance, itself. A reading of "The Data Dilemma and Valuentum Investing" in the Preface is necessary to understand the various types of data Nelson refers to frequently in this text: ambiguous, causal and impractical. Also emphasized in this book is the difference between in-sample, out-of-sample and walk-forward studies, the latter the author believes to be the most robust and authentic of processes. In the first section of this book (chapters 1 through 3), Nelson welcomes you on a journey through the early lessons of his career and introduces some of the major shortcomings of traditional quant factor-based analysis, while building up the importance of a common theme in this text: the information contained in share prices. In the second section of this book (chapters 4 through 6), the causal nature of enterprise valuation to stock prices is explained, culminating in the Theory of Universal Valuation, which offers enterprise valuation as the central theme to quantitative value studies, efficient markets hypothesis testing and beyond. If at any time, it gets too theoretical, Nelson encourages the casual reader to skip ahead. Image shown: In early January 2019, Value Trap was the #1 Best Seller in Valuation on Amazon. In the final section of the book (chapters 7 through 10), Nelson talks about practical application of the principles explained in this text: how enterprise valuation can be used to identify bubbles and mispricings, how it’s valuable to dividend-growth and income frameworks, how it’s connected to economic moat and economic castle theory, and how it can be applied practically in an equity portfolio setting, as in Valuentum investing. This book is not a how-to manual on how to perform enterprise valuation, or a get-rich-quick investment program, but rather a text that Nelson feels lays the foundation for a genuine conversation about stock investing, a conversation about price versus estimated intrinsic value. The book is chock-full of footnotes, too, offering greater depth in areas that may require it. This book is content-rich for the number of pages, as the author wants every sentence, every paragraph to be worth your while. Mr. Nelson has over 15 years' experience in enterprise valuation and holds the Chartered Financial Analyst designation. Valuentum is a financial publisher so why does it include ‘Securities’ in its corporate name? It’s what we’re passionate about. We believe Security Analysis, in the spirit of Benjamin Graham and Warren Buffett, is of utmost importance to any investment consideration. Past results are not a guarantee of future performance. The High Yield Dividend Newsletter portfolio, Best Ideas Newsletter portfolio and Dividend Growth Newsletter portfolio are not real money portfolios. Any performance, including that in the Nelson Exclusive publication, is hypothetical and does not represent actual trading. Valuentum is an investment research publishing company.